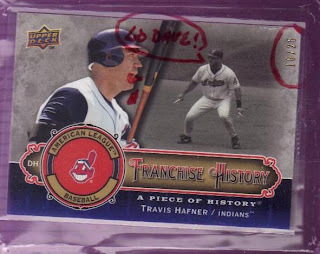 Tom O wrote me some time ago, letting me know that he had a Travis Hafner "Franchise History" serially-numbered card he wanted to send my way. I was for that! He then wrote to say that my "care package" was on its way and that it included a few extras... He was not kidding! 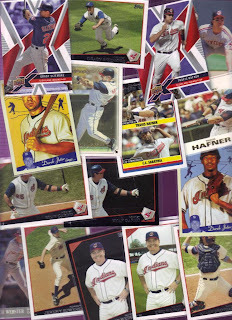 The first thing I remember seeing when I opened the box was the Hafner card, though it appeared to have been "Tiptoned..."
Of course, the writing was on the sleeve that held several cards. But, you know, it is not everyday you get a card of Pronk giving me a shout out! Not quite sure what's going on with "big Haf's" mouth though... Did he get hit with the bat? Ouch. 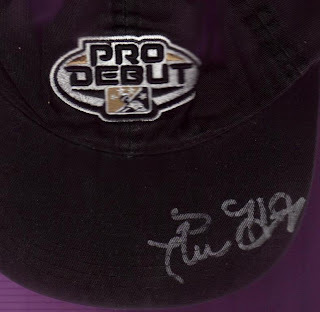 The next item to show off is an autographed Pedro Alvarez cap! Alvarez was the #2 overall draft pick in 2008 for the Pittsburgh Pirates (my hometown, for those that may not know). This a is a great non-Triber addition to my collection!! But, wait, there's more! 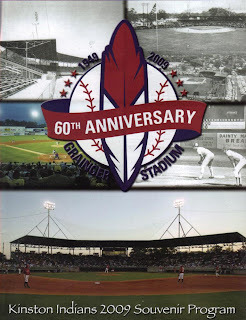 Tom also included a 2009 Kinston Indians program, celebrating 60 years of the MiLB team. See, Tom lives in North Carolina and says he goes to many of the Indians games there. Now, how cool is that!? Of course, he could not complete a care package without a bunch of cards, right!? Well, there are cards for sure! 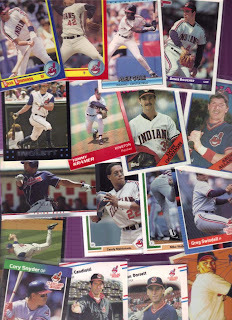 As you can see, not just Indians, but also Cavaliers and Browns in the mix, too. 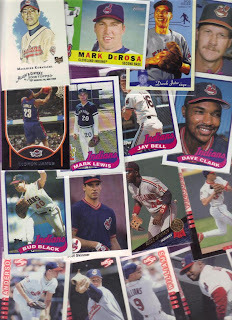 There are also those cool "black-background" Topps cards that ticked off a bunch of collectors. I like the blacked background cards a whole lot - very cool and kinda artsy or something. I don't have the words for it, but I like 'em! THANK YOU very, very much, Tom! This was a GREAT "care package!" While I don't have auto'd caps to send your way, I do have a few surprises headed your direction. Nice PACKAGE !! 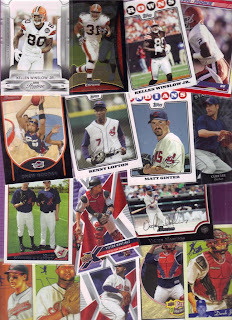 If you don't have room for that Hafner card in any of your binders I could force myself to take it off you hands! !